Wisconsin Oven Corporation announced the shipment of one (1) natural gas fired conveyor oven to a supplier of the oil and gas industry. This conveyor oven will be used for the preheating and powder coating of couplings. This conveyor oven has sufficient capability to heat 1,000 pounds per hour of steel parts from 70° F to 1000° F, provided that the workload is configured in a manner that is capable of absorbing the heat that is generated within the time available. The powder coating conveyor oven has a maximum temp of 1,000° F with guaranteed temperature uniformity of ±10° F at 1000° F.
The work chamber of this conveyor oven is 2'0" wide x 10'0" long x 1’2" high and was designed with bottom-up airflow to maximize heating rates and temperature uniformity of the part load configuration. A roller chain conveyor system with cross flight attachments was utilized to transport the product through the system and a variable frequency drive provides adjustable speed control. Fabric ribbon curtains are located at both ends of the conveyor to prevent heat spill out. Fabric ribbon curtains are located at both ends of the conveyor to reduce heat spill-out. 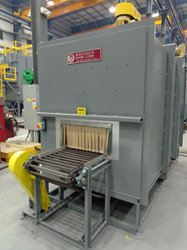 This industrial conveyor oven was fully factory tested and adjusted prior to shipment from our facility. All safety interlocks are checked for proper operation and the equipment is operated at the normal and maximum operating temperatures. An extensive quality assurance check list was completed to ensure the equipment met all Wisconsin Oven quality standards. To learn more about the industrial conveyor ovens manufactured by Wisconsin Oven visit their website at https://www.wisoven.com/products/conveyor-ovens. Wisconsin Oven Corporation has been designing, engineering, and manufacturing industrial ovens and other heating equipment since 1973. Their custom and standard industrial ovens are used for a multitude of applications including heat treating, finishing, drying, and curing. Many of the industries they serve require specific temperature uniformity and equipment performance documentation. Their experienced design team can meet even the most stringent standards for their customers’ equipment. Wisconsin Oven realizes that the success of the company depends on their Championship team of employees, which is why they have developed a company culture that recognizes and rewards employees. The goal at Wisconsin Oven is to outperform competition and provide customers with outstanding products and service. For more information on Wisconsin Oven visit their website at http://www.wisoven.com. Wisconsin Oven is owned by Thermal Product Solutions (“TPS”), a leading American manufacturer of industrial ovens, furnaces, pharmaceutical sterilizers, laboratory ovens, environmental temperature chambers, and stability test chambers. TPS provides thermal processing and test solutions for a range of industries. TPS brands include Baker Furnace, Blue M, Gruenberg, Tenney, Lindberg, Lunaire, MPH, and Wisconsin Oven. For more information on equipment solutions from TPS visit their website at http://www.thermalproductsolutions.com.